FAI chief executive John Delaney should step down, a Government TD has claimed. Fine Gael's Noel Rock said Mr Delaney's performance as the head of Irish football was not living up to his "Rolls-Royce salary" and insisted he should resign from the €360,000-a-year position. It comes as the FAI faces questions on a €100,000 bridging loan given by Mr Delaney to the association in April 2017. The FAI has said the loan was repaid in full two months later. Mr Delaney is set to be quizzed on the issue by TDs and senators when he appears before the Oireachtas Joint Committee on Sport as early as April 3. However, Mr Rock - a member of the committee - has argued the issue of the loan was "overshadowing" the on-field performance of the Irish football team, who play Gibraltar tomorrow. Speaking on the Independent.ie 'Floating Voter' podcast, Mr Rock said: "I think it's time for John Delaney to step aside." "We pay a Rolls-Royce salary, €360,000 a year, for John Delaney. Do we get a Rolls-Royce performance out of that? I'm not sure," he added. Mr Rock claimed there were "clear issues of governance, of competence and of finance" within the FAI after reports emerged about the loan Mr Delaney paid to the association. Separately, Fergus O'Dowd, the chairman of the Oireachtas Joint Committee on Sport, said there was "no point" in TDs and senators quizzing Mr Delaney until a review of the organisation's executive governance had been completed. The committee is scheduled to meet the FAI on April 10. However, the FAI wrote to the committee noting that some of its members had speculated about the possibility of bringing the meeting forward. The FAI suggested April 3 as a date that representatives would be "happy" to attend. Mr O'Dowd said that the committee would decide next week when the meeting with Mr Delaney would ultimately be held. He said that he had asked the committee's clerk to contact the FAI to ask whether the organisation's review of governance would be finished in time for Mr Delaney's appearance. Mr O'Dowd said that if the report wasn't complete by April 3, it was his view there was "no point" in meeting the FAI on that day. He said it was the duty of his committee to look at governance issues at all sporting organisations, and added: "I would recommend that we wouldn't meet them on that day if we don't have the governance report." Earlier this week, the FAI said it had been undertaking a full review of its executive governance and senior management structures. A statement said: "This review will be completed and all actions approved by early April when a full press conference will be held to reveal all outcomes. "In the meantime, the association reiterates that the bridging loan was made in the best interests of the FAI in 2017 when it experienced a short-term, cash-flow issue." The FAI board was "kept fully informed" in relation to the matter "at all times", it said. The Irish Independent last night asked the FAI whether Mr Delaney had a response to Mr Rock's call for him to step down. It was also asked whether the review of executive governance would be completed before April 3. 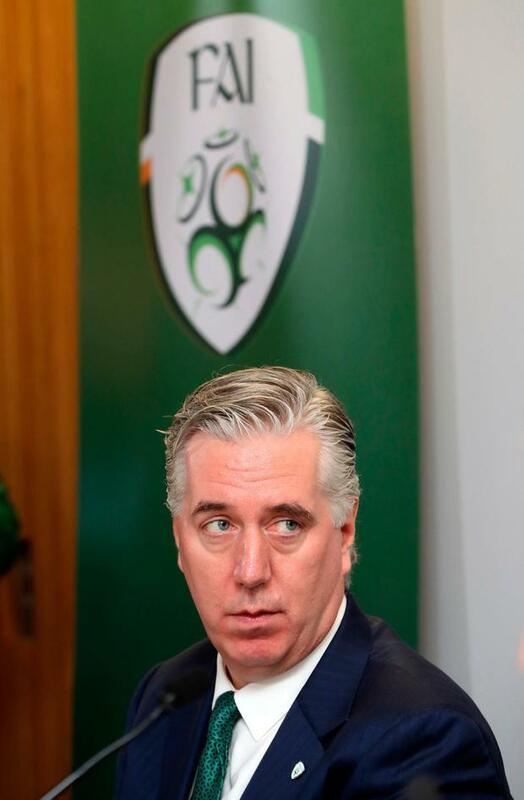 The FAI declined to offer a comment on either issue last night.